Board certified by the American Board of Radiology, Dr. Luke Maj serves as the Director of the Water’s Edge Vein Center. 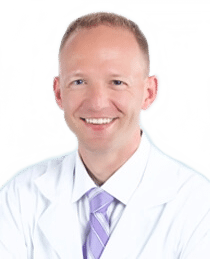 He earned his medical degree at Northeast Ohio Medical University and completed his residency in radiology at the University of Illinois Chicago. In addition to his role at Water’s Edge Vein Center, Dr. Maj serves as an Assistant Professor of Radiology at the University of Miami, Miller School of Medicine. Dr. Maj has a comprehensive background in minimally invasive interventional procedures, including nationally presented work in radiofrequency tumor ablation assisted by contrast-enhanced ultrasound, as well as dedicated research in limb salvage via catheter-directed thrombolysis. Dr. Maj’s interests include educating patients in innovative treatment options for post-thrombotic syndrome in patients with chronic venous insufficiency following a diagnosis of deep vein thrombosis (blood clot in the legs). He welcomes such patients for a one-on-one consultation to learn about and discuss interventions and treatment options that may not have been previously offered with their post-thrombotic syndrome. Dr. Maj has significant experience and compassion for patients dealing with lifelong effects of lymphedema (primary and secondary) and specifically vasogenic origin of lymphedema from venous disease. With his profound knowledge, vast experience, and personal interest in all of the latest vein technologies, Dr. Maj focuses on advancements in the treatment of vein disease. Through a comprehensive vascular evaluation, he can provide his patients with the most up-to-date and beneficial interventions and conservative treatment options for the best possible cosmetic and physiologic results, with little or no pain and quick recovery time. Dr. Maj, who is fluent in Polish, is highly passionate about helping each and every patient enhance their vein health.